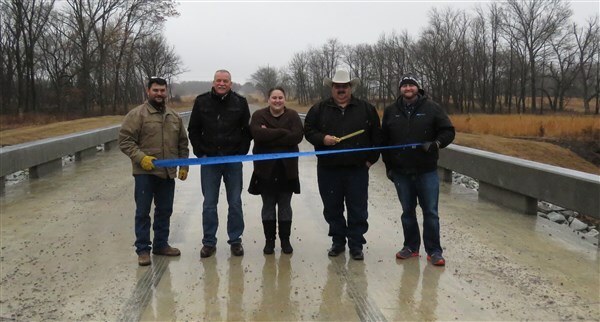 Despite the cold rain, Nowata County and GUY Engineering celebrated the completion of two bridges with a ribbon cutting on February 22. The recently completed bridges were Bridge #7 over Tributary to Opossum Creek and Bridge #7A over Opossum Creek. The new bridges are PC beam bridges that replace low water crossings on NS 406 Rd in Nowata County District 2. They were designed by Guy Engineering Services of Tulsa, OK and constructed by Reece Construction of Skandia, KS. Funding for this project was provided through the County Improvements for Roads and Bridges program (state funding) and Surface Transportation Program funds (federal funding).